The Frightened Woman is a Nord farmer who appears randomly and provides directions and an updated map marker to Mistwatch. When you meet her she will seek you out and say: "Oh, thank goodness! I've been wandering alone for so long, I thought I'd never see another soul again." When you tell her to calm down and elaborate she will say: "I was kidnapped by these bandits weeks ago. They locked me up in the towers near Mistwatch. I managed to pick the lock and slip out while the guard slept, but now I'm completely lost. Can you help me, please?" When you point her towards the nearest town, she will be grateful: "Oh, thank you, but I should be fine now that you've shown me the way. But those bandits have to be stopped! They're at Mistwatch. Here, let me show you on your map.... If you can stop them, you'll be a true hero!" She will then finish conversation and run away. She wears a typical prisoner's outfit, including a roughspun tunic and footwraps. She has a small chance of carrying a lockpick and a small amount of gold. 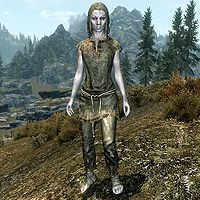 If she isn't killed on the way to the nearest town, she can sometimes be found working as a laborer later in the game. The world encounter "Mistwatch Escapee" never removes her from the game after speaking to you about the bandits at Mistwatch.